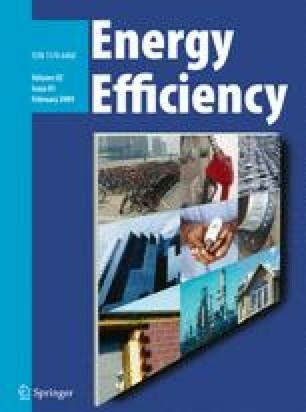 This article examines the future role of energy efficiency as a resource in the Western US and Canada, as envisioned in the most recent resource plans issued by 16 utilities, representing about 60% of the region’s load. Utility and third-party-administered energy-efficiency programs proposed by 15 utilities over a 10-year horizon would save almost 19,000 GWh annually, about 5.2% of forecast load. There are clear regional trends in the aggressiveness of proposed energy savings. California’s investor-owned utilities (IOUs) had the most aggressive savings targets, followed by IOUs in the Pacific Northwest, and the lowest savings were proposed by utilities in Inland West states and by two public utilities on the West Coast. The adoption of multiple, aggressive policies targeting energy efficiency and climate change appears to produce sizeable energy-efficiency commitments. Certain specific policies, such as mandated energy savings goals for California’s IOUs and energy-efficiency provisions in Nevada’s Renewable Portfolio Standard, had a direct impact on the level of energy savings included in the resource plans. Other policies, such as revenue decoupling and shareholder incentives and voluntary or legislatively mandated greenhouse gas emission reduction policies, may have also impacted utilities’ energy-efficiency commitments, though the effects of these policies are not easily measured. Despite progress among the utilities in our sample, more aggressive energy-efficiency strategies that include high-efficiency standards for additional appliances and equipment, tighter building codes for new construction and renovation, as well as more comprehensive ratepayer-funded energy-efficiency programs are likely to be necessary to achieve a region-wide goal of meeting 20% of electricity demand with efficiency in 2020. The work described in this report was funded by the Permitting, Siting, and Analysis Division of the Office of Electricity Delivery and Energy Reliability of the US Department of Energy under contract no. DE-AC02-05CH11231. Anonymous. (2005a) California Senate Bill 1037 (SB 1037). September 29. http://www.leginfo.ca.gov/pub/05-06/bill/sen/sb_1001-1050/sb_1037_bill_20050929_chaptered.pdf. Accessed 7 March 2008. Anonymous. (2005b) Nevada Assembly Bill No.3 (AB 3). June 7. http://www.pewclimate.org/what_s_being_done/in_the_states/rps.cfm. Accessed 10 March 2008. Anonymous. (2006). Washington Voter Initiative (VI) 937. http://www.secstate.wa.gov/elections/initiatives/text/i937.pdf. Accessed 10 March 2008. Anonymous. (2007) Colorado House Bill 07-1037 (HB 07-1037). April. http://www.state.co.us/gov_dir/leg_dir/olls/sl2007a/sl_253.pdf. Accessed 12 March 2008. California Public Utilities Commission (CPUC). (2004). Interim opinion: Energy savings goals for program year 2006 and beyond. CPUC Decision 04-09-060. September 23. http://docs.cpuc.ca.gov/PUBLISHED/FINAL_DECISION/40212.htm. Accessed 13 March 2008. Hydro, B. C. (2006). BC Hydro 2005 annual report. http://www.bchydro.com/info/reports/2005annualreport/report39515.html Accessed 14 March 2008. Jensen, V. R. (2007). Aligning utility incentives with investment in energy efficiency. Prepared for the national action plan for energy efficiency. www.epa.gov/eeactionplan. Accessed 27 March 2008. United States Energy Information Administration (EIA). (2006). Form-861: annual electric power industry report. http://www.eia.doe.gov/cneaf/electricity/page/eia861.html. Accessed 14 March 2008. Western Electricity Coordinating Council (WECC). (2005). Hourly demands 1998–2004. http://www.wecc.biz/modules.php?op=modload&name=Downloads&file=index&req=viewsdownload&sid=149. Accessed 13 March 2008. Western Governor’s Association (WGA). (2004). WGA policy resolution 04-14: Clean and diversified energy initiative for the West. June 22. http://www.westgov.org/wga/initiatives/cdeac/index.htm. Accessed 8 March 2008. Western Governors’ Association Clean and Diversified Energy Advisory Committee (WGA CDEAC). (2006). Energy Efficiency Task Force report. January. http://www.westgov.org/wga/initiatives/cdeac/Energy%20Efficiency.htm. Accessed 8 March 2008. Western Governors’ Association Clean and Diversified Energy Advisory Committee (WGA CDEAC). (2007). Clean energy, a strong economy and a healthy environment: Western Governors’ Association Clean and Diversified Energy Initiative 2005–2007 progress report. June 10. http://www.westgov.org/wga/initiatives/cdeac/index.htm. Accessed 7 March 2008.